Swanky Digs: The fun part of my job. The fun part of my job. At work right now we are in the planning stages of next year's lotto home. (The builder I work for donates a house - or two - every year for the lottery that supports our local children's hospital.) It's the first year I get to be involved and I'm excited about it - I get to decorate the kids' playroom and the boy's bedroom. 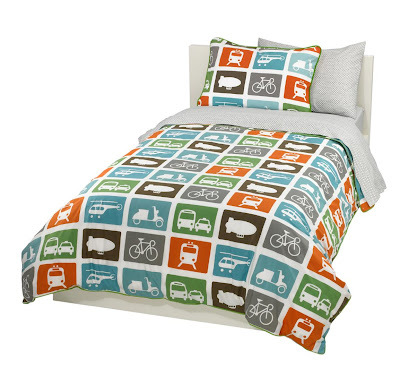 This is the bedding I just bought for the bedroom. I know, can't go wrong with Dwell, right? The whole house will have dark gray woodwork, so the gray in this ties in well and gives me lots of other fun color options to go with it. I'm feeling pretty good about the direction I'm headed with this one - so I'm pretty sure I'll want to share the photos when it's done. Stay tuned!